Our guest blog this month is courtesy of Gareth Dinnage, Managing Director of Seacourt Ltd, a Queen’s Award winning environmental printers. Read on to find out how Seacourt became the world’s first ZERO waste to landfill print company and for Gareth’s top tips on how you can become more eco-friendly to make a positive impact on climate change. Seacourt is very proud to be working in partnership with Nikwax; we share a common ethos on how business ought to be done – simply not compromising on environmental performance, challenging conventional thinking of what is possible, being an exemplar in our respective industries and showing that having sustainability at the heart of the business simply makes sense all round. The print industry is one of the most environmentally damaging sectors and is considered so potentially destructive for the environment that Det Norsk Veritas puts it in the same pollution insurance risk category as mining, oil exploration and the nuclear energy sectors. Not only does our industry use large volumes of fresh water and highly contaminating chemicals, but it also consumes a huge amount of power with many factories running twenty-four seven. The majority of printers will be running on energy produced by coal, oil or natural gas – all major contributors to CO2. Most print companies will recycle their printing plates and waste paper, but the majority of the rest of their waste will be collected by commercial disposal organisations and no doubt end up in landfill. Becoming a waterless printer in 1997 was the start of Seacourt’s environmental journey and has not only helped us save over 8 million litres of fresh finite water, but as importantly removed our use of environmentally damaging chemicals. In 1998 we gained ISO14001 and in 1999 became the second printing company worldwide to attain EMAS. In 2001 we were certified as carbon neutral and 2003 saw Seacourt switch to 100% renewable energies. In 2009 we finally broke the back of waste disposal and became the world’s first zero waste to landfill printing company! We never sit still when it comes to looking after our planet and this year has been no different to previous. 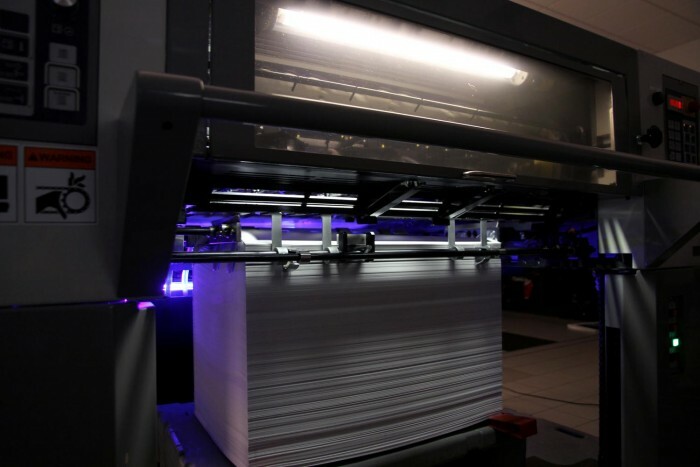 We have just reinvented the printing press with our world first revolutionary process LightTouch – combining Waterless printing with LED technology for the first time – and ensure that all our clients’ materials are produced with the lightest environmental footprint possible, anywhere in the world – which is why Nikwax sees us as the perfect print partner. LightTouch has seen us take all chemicals and water usage out of the printing process – so all we have is VOC-free inks and nothing else… No water, no chemicals, no seal varnishes or set off sprays. We even use less ink as we no longer need to wash the press up daily. It’s all about doing significantly more with significantly less resource. In 2016 Seacourt will celebrate its 70th birthday and over the last 20 years of our environmental journey one single question has been constant, “Will this improve our environmental performance?”. If the answer is yes, we proceed, with financial implications being a secondary consequence to our core belief. If you know there is a better way, then why would you not peruse it? Our journey has also brought many accolades and we are proud to have been recognised by the Queen for our industry leading approach with x2 Queen’s Awards for Sustainable Development in 2007 and 2011. There’s no magic silver bullet to climate change, it’s the small incremental adjustments that will lead to positive change. Switching your energy supplier to 100% renewable energy, only takes a phone call or an email and the tariffs are much more competitive than they have ever been. Buy a bike! Reduce the road miles in your car. Home composting, get a composter in the garden for your food waste and garden waste – easy way to divert waste to landfill and produce some useful compost for your plants. Ethical banking – if you have an ISA or savings account why not transfer to an ethical bank who are committed to funding social enterprises? Still get a great interest rate but you can be helping improve people’s quality of life! Lastly – speak to your friends! If you can do the first four and tell 5 friends about it and why, and they then adopt these changes and tell 5 of their friends, and so it goes on, then you have started something very powerful, making real positive change happen!